What a wonderful way to pay tribute to your beloved pet. 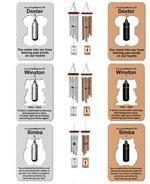 These highly personalized windchimes truly make them one-of-a-kind and all your own. The body of these high quality wind chimes is made of ash hardwood with a warm red stain and finished with an outdoor UV resistant, clear semi gloss polyurethane. The pentatonic tuned tubes are made of a non-rusting anodized aluminum tubing and are available in three different sizes and in your choice of silver or dark bronze. What makes these chimes particularly special is the UV resistant acrylic wind sail. The center of wind sail cut-out contains a cherished photo which is then surrounded by your pet's name with dates and/or your personal sentiment. The choice is totally yours. Your photo along with personalized inscription will be expertly engraved in black and will be visible from both sides, making a high contrast, easy to read memorial. Our graphic designer tastefully chooses the formatting, spacing between paragraphs, centering, and font size. The 19" chimes are tuned to the ancient pantatonic notes of D, B flat, E flat, A and G.
The 29" and 39" chimes are in the notes of D, F, G, B flat, C and D.
A truly custom, unique, and beautiful memorial urn wind chime that will bring solace for years to come. Your order will be processed once we receive a high resolution photo. Please email your photo choice to: customerservice@rainbowbridgeurns.com with your order number in the subject line. Select What Size Chime Would You Like? 19" 29" 39"